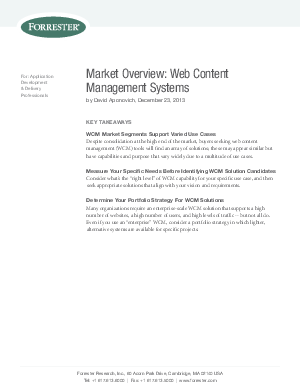 The relevance of web content management (WCM) has never been higher as businesses and brands leverage this technology to support their multichannel digital customer experiences. internally facing websites. Application development and delivery (AD&D) professionals involved in the selection of a new WCM platform should consider the potential suitability of vendors in the context of their specific projects — ranging from dot-com sites to focused projects and applications, such as brand and campaign sites, product microsites, and franchise and dealer platforms.